In No Man's Sky, there are countless spaceships that you cannot really be summarized in one guide. However, these spaceships can be divided into different types or categories and these in turn have their own functions. In our guide we will show you what types of spaceships are available in No Man's Sky and how they are best suit for your playing style. 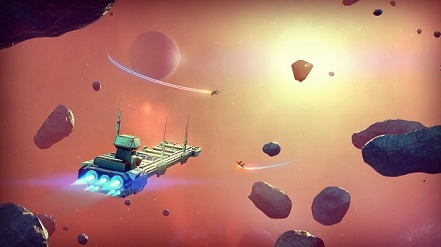 Overall, you can limit it to three types of spaceships in No Man's Sky. These differ in their functions and can enhance with various technologies. Your first spacecraft will eventually no longer be sufficient, particularly in that the cargo space is too small. In our beginners guide article, we give you some useful tips to repair these old rusted Spaceships. The three types of spaceships can be correspondingly derived from these four categories,. If you build / upgrade the weapons of the spaceship, then you develop your vehicle more likely in the direction of warship / fighter. This in turn is particularly useful when you decide on a military style of play. As with many strategy games, in No Man's Sky it is possible for you to decide for an aggressive, scientific, diplomatic or economic way of playing. Accordingly, you should also make the best for you spaceships, because a vehicle that is equipped rather for science will not necessarily look good in a fight. Of course you can mix the types of spaceships, but then you will not be able to fully strengthen for a particular situation. The following list gives you the description of the types; consider which is the best spaceship for your playing style. Combat ships / Hunter: Improve your weapons and health of your spaceship, you will create a battleship / Hunter, which will assist you in particularly in an aggressive and warlike approach. In this way, you are better equipped against space pirates and -Police. So you can achieve with violence and shoot to other ships and collect their loot. Explorers: spaceships, which are best suited for explorers, should benefit from an improved hyperdrive and possibly a stronger scanner. These spaceships are best suited for players who want to flee from threats and to invest their hard-earned Units in the discovery. Merchantmen / transports: You move to trade routes and make your money trying to sell off expensive and specific goods, then the best spaceship for this project is one with a large cargo space. This in turn should have a good health, because you will be attacked by robbers, if your merchandise is valuable. In addition, you can use a hyperdrive to escape quickly or better weapons to fight back.